Available now from Amazon in hardcover and for Kindle on Amazon. Starting with the Thanksgiving turkey that never quite finishes cooking, then moving to the polenta that unceremoniously goes runny and the guests that arrive a day early—there is no topic Tess Rafferty fails to encounter, or hilariously recount. 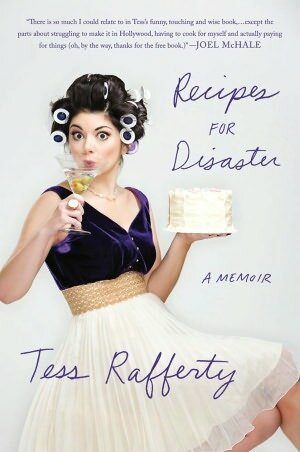 Recipes for Disaster is as though Bridget Jones wrote a culinary narrative—the most pristine of intentions slowly disappear, as does the wine along with any hope of a seamless and well-orchestrated dinner party. Told with heart, humor, and honesty; this memoir goes beyond culinary catastrophe and heartwarmingly unveils the lengths we go to in order to please our family, friends, and ourselves—and proves that it’s not the food that counts, but the memories. Aptly timed for all the Thanksgiving chefs about to enter the holiday gauntlet, or the guests headed to their dinners—this is the perfect book to read and then savor.